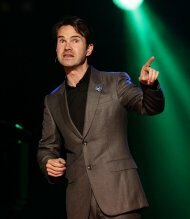 Politics UK - News: Comedian Jimmy Carr - "I pay what I have to and not a penny more." Comedian Jimmy Carr - "I pay what I have to and not a penny more." Comedian Jimmy Carr has broken his silence over claims that he dodged tax, insisting: "I pay what I have to and not a penny more." The funnyman is said to have used an aggressive - but legal - tax-avoidance scheme which enables members to pay income tax rates as low as 1%. Carr, who has famously lampooned fat cat bankers, reportedly protects some £3.3 million a year by channelling cash through Jersey-based company K2 which then returns the money in the form of a loan. This is not subject to income tax. He spoke out amid claims that members of Take That - Gary Barlow, Howard Donald, Mark Owen and their manager Jonathan Wild - invested at least £26 million in another scheme run by Icebreaker Management Services. Carr was confronted over his own financial arrangements during a show in Tunbridge Wells, Kent. Challenged by a member of the audience who told him "You don't pay tax", he replied: "I pay what I have to and not a penny more", The Times reported. It came after he appeared to make light of the furore surrounding his payments to HM Revenue and Customs (HMRC). He asked: "Got through the papers? I haven't really been through the papers today. The Murdochs are after me..."
Carr is said to be one of more than 1,000 beneficiaries who shelter some £168 million from the taxman each year using K2. A Revenue and Customs spokesman said it had successfully challenged an avoidance scheme run by Icebreaker 1 LLP, winning on the main arguments in the tribunals. HMRC said the K2 scheme was already under investigation.